(CNN) -- President Obama said Wednesday the United States must take the lead on energy, citing the "enormous job creation potential that exists." President Obama holds talks with members of the Economic Recovery Advisory Board on Wednesday. Obama's remarks came at the end of his first quarterly meeting with the Economic Recovery Advisory Board, which was created in February to provide the administration with independent, nonpartisan advice on how to promote economic growth and stability. The focus of Wednesday's meeting, which was streamed live on the White House Web site, was job creation and green energy. "But obviously, one of the things I've been concerned about since I took office is looking beyond the immediate crisis in front of us to find out what is a sustainable economic model, post bubble and bust," he said. "How do we create sound fundamentals on issues like education, on health care and ... energy, as well as all the innovation that's required around these various areas, so that moving forward, we don't find ourselves in an unsustainable economic model?" he asked. Paul Volcker, who chairs the board, said as the panel discusses investments, they can't forget the risks of inaction. "There isn't enough emphasis, it seems to me, on the cost of what happens if we don't do anything," said Volcker, who served as the chairman of the Federal Reserve during the Carter and Reagan administrations. Obama said the steps taken around energy this week have been "promising." The president on Tuesday announced new fuel economy rules, including a requirement for passenger cars and light trucks to get an overall average of 35.5 miles per gallon by 2016. 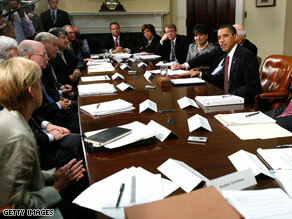 Obama and the board spent about an hour discussing the immediate opportunities and challenges for green energy. Panel members expressed concerned that the United States is behind other countries in controlling carbon emissions. "We think it's very important to act now," said John Doerr, a partner with Kleiner, Perkins, Caufield & Byers. "If we act now, and send very clear signals to our business community and the nation." Doerr said he thinks "putting a price on carbon" is the most important thing they can do, but he said it's not the only policy that can be adopted. He also stressed the importance of research and development funding. Obama has been pushing Congress to move ahead with legislation that places a market-based cap on carbon pollution. Board member Jeffrey R. Immelt, the chairman and CEO of GE, called clean energy "the most exciting, fastest growth industry of the 21st century." He said his company's 70 energy-efficiency products are generating $18 billion in revenue and accounting for 50,000 jobs between GE and its suppliers. "Technology is out there to be had. I think we have to have a broad aspiration to lead in technology," Immelt said. Richard Trumka, the secretary-treasurer of the AFL-CIO, said he sees clean energy as a "tremendous potential for us to lead" and an opportunity for solid, middle-class jobs. Trumka expressed concern, however, that the tax code and various trade agreements the administration was looking at could put them at a disadvantage in the global market. But overall, he said, he sees green energy as a "win, win, win" for the country. The advisory board has been established for a two-year term, after which Obama will determine whether it is still needed. It is modeled on the Foreign Intelligence Advisory Board, created during the Eisenhower administration to provide the president independent advice on global affairs. Austan Goolsbee, a University of Chicago economist, serves as the board's staff director and chief economist. He also served as an economic adviser for Obama's presidential campaign. • Mark T. Gallogly, founder and managing partner of Centerbridge Partners L.P.
• Jim Owens, chairman and CEO of Caterpillar Inc.
CNN's Kristi Keck contributed to this report.